the exile of heart and soul. Exile, in this song, is the seperation from one whom you love and is more than merely a physical experience. Yet in the loneliness of this song there is hope and determination. A vocalised version of the song was released as a b-side ‘As Baile’ in 1991. 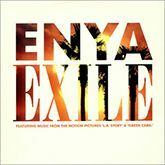 ‘Exile’ was the first lyric Roma wrote for the album. The single was released in 1991 to mark the use of the included tracks in the ‘Green Card’ and ‘L.A. Story’ movies. The music video, directed by Michael Geoghegan, features scenes from the film ‘L.A. Story’ that used the song. I’ll find a way home.